Tottori Prefecture and Western Jamaica’s relationship has been growing deeper and closer. Culture, sports, tourism, education and training partnerships have been mutually beneficial and the signs are that it will only get between for the 2020 Olympics and beyond. The latest chapter in the partnerhsip/love story involves 10 students from Yonago High School visiting Western Jamaica and having meaningful exchanges with their peers at Little London High School and Grange Hill High School in Westmorland. 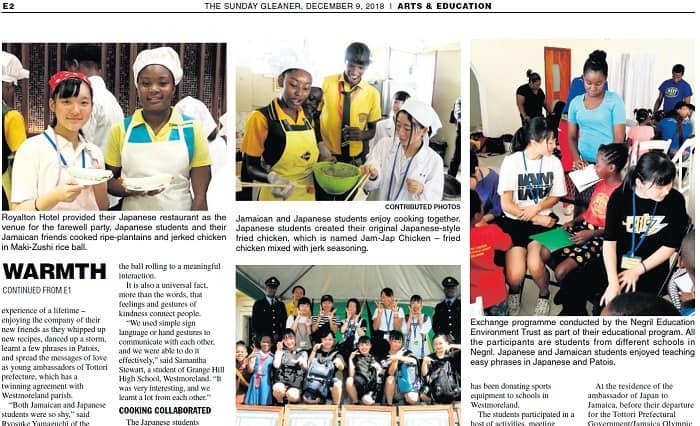 I really felt all warm and fuzzy when I read the article in the Jamaica Gleaner – “Japanese Students share Jamaican Warmth.” As a Jamaican living in Japan next door to Tottori Prefecture teaching English and exchanging Jamaican culture with kids here I have really enjoyed following this partnership. Check out the article and share your thoughts in a comment below or tweet me @Jamaipanese on Twitter. Cheers!